Long sequestered in the lap of the Himalayas , sandwiched between Nepal Bhutan and Tibet lies a small strech of rugged land just 40 miles by 70 miles, the erstwhile Kingdom of Sikkim - now a state of India. Sikkim provides a wide potential in tourism that has yet largely remained unexploited. The perennially snow-capped mountains, lush green tropical and temperate forests, gurgling streams and the rich flora and fauna - a true Shangrila or “Nye-mae-el” which simply means ‘heaven'. Day 01. Delhi stay- on arrival pickup from the international airport and transfer to hotel, over night at hotel. Day 02. Delhi/Rishikesh early morning drive to Rishikesh, rest of the day free for personal activities, overnight at hotel. Day 03. Rishikesh/Uttarkashi A drives of approx. 6 hrs after an early breakfast. Breathtaking views for the enthusiastic traveller. From flowing river to exotic hills, a keen eye will catch sight of the change in flora at different heights. Over night at hotel. Day 04. 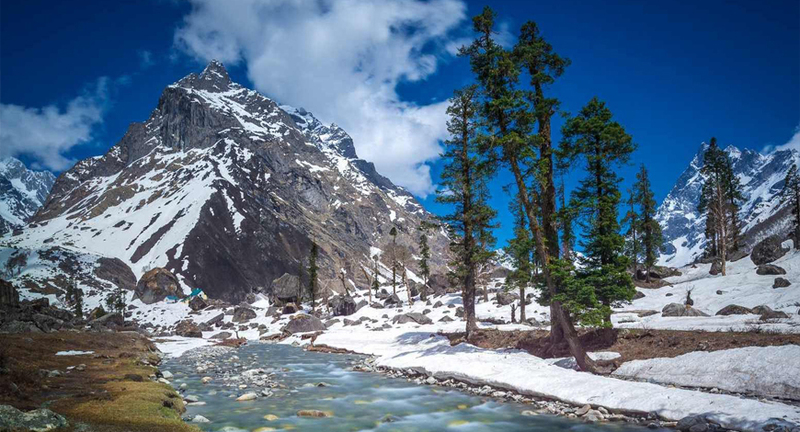 Uttarkashi/Kalyani /Dodi Tal: A short drive before you set off the trekking that awaits you the next few days. Dodi Tal is a sparking and crystal clear lake, which is surrounded by forests. The trek ascends gradually through thick forests and beautiful mountainous scenery. Day 06. Sima/Hanuman Chatti: 4 kms into trekking and walks into dense forests of fur and deodar, which are full of rare Himalayan birds and animals. Interesting downhill routes take you to the base camp. Over night in tent at Hanuman Chatti. Day 07. Hanuman Chatti/Netwar: Panoramic scenes and the drive along the river Yamuna in Western Garhwal . The region is better known for the polyandrous society. Over night in tent at Netwar. Day 08. Netwar/Taluka: This part of the Har-Ki-Dun trek over the next few days is of great interest. Motorable road under construction. The forests are rich in wildlife an is veritable paradise for bird watchers and nature lovers. The trek is through dense forests of chestnuts, walnuts, willows, chinars and a variety of conifer trees. Over night at tent in Taluka. Day 09. Taluka/Har-Ki-Dun: glittering peaks and dense forests surround Har-ki-dun. The forests are rich in wild life and are veritable paradise for bird watchers and nature lovers. The walk is through lush green terraced fields, grassy lands and very thick conifer forests. It is one of the most picturesque spots in the Garhwal Hills. Over night in tent at Har-Ki-Dun. Day 10. Har-Ki-Dun/Taluka: Over night in tent at Taluka. Day 11. Taluka/Netwar: Over night in tent at Netwar. Day 12. Netwar/Mussoorie: On arrival check in to hotel and a visit to the Mall, spend your day relaxing in the midst of the serene hills of Mussoorie. Over night at hotel in Mussoorie. Day 13. Mussoorie/Haridwar: Transfer to Haridwar, beside the holy river of Ganga . Over night at hotel in Haridwar. Day 14. Haridwar/Delhi: Early morning drive to Delhi , over night at hotel in Delhi . Day 15. Transfer to the International Airport to catch the flight for onward destination and the tour concludes.